Looks like a gun but it’s safe! Milled soap is popular because it allows the manufacturer to reduce the amount of scent needed, since the scent is added during the milling phase and doesn’t react with the lye while the fats are saponifying. It smells better and it’s a bit cheaper and you can do more complex molds. I do cold process and mix the scents at trace, right before I pour it, so I need molds that are open on one side so the moisture can get out as the soap cures. 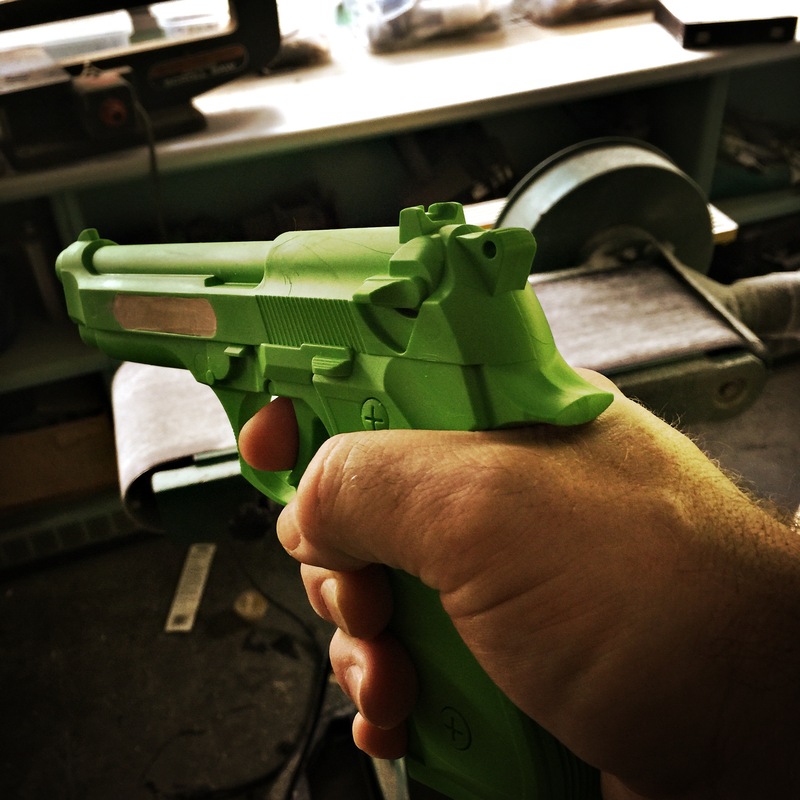 making a flat gun! bandsaw!! Mr Happy Bandsaw makes the gun flat on one side in about 3 seconds. A minute or two on the belt sander makes it lovely and smooth as a baby’s bottom. To be exact: a baby’s bottom that’s been on a belt sander. Next, you want to go around with oil-based clay and fill in places which will be hard to mold. If I were reproducing the model using epoxy resin I wouldn’t need to do this since the silicone is stretchy enough to pull out around under-cuts. But since I’m working in soap I can’t make things too thin or complex. When I did my soap ganesh I had to do a lot of filling in under arms and such so that the soap would demold without tearing. You can see here I filled in the bottom back of the trigger guard. 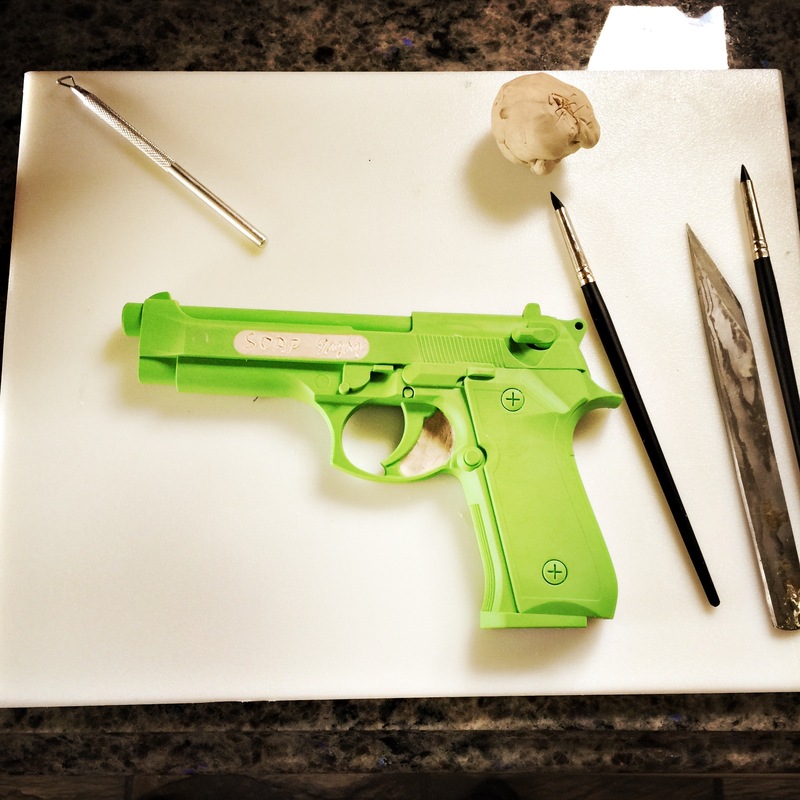 That way the trigger will still look triggery but it’ll have a 1/4″ soap fillet supporting it. I’m going to have to be careful demolding the guard. I didn’t put a lot of work into this. It’s a soap mold. Of a gun. I’ll probably make 4 or 5 during the rest of my life; no sense going overboard. 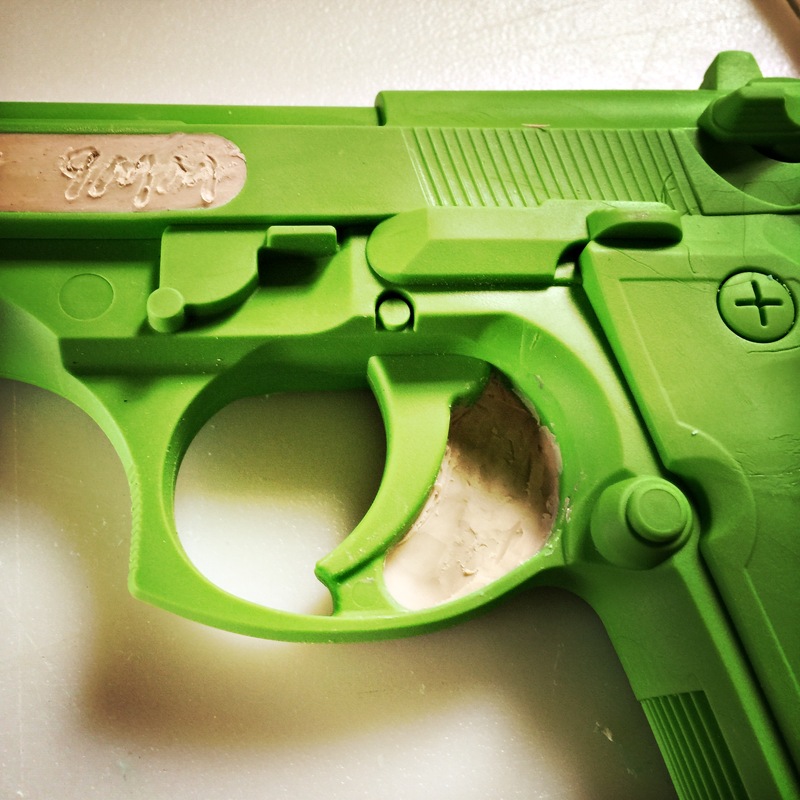 There was a cartouche in the side of the model that had the manufacturer’s name and I decided to fill it and scratch-scrawled “soap 9mm” in the clay. A point: this is a copyright violation, sort of. But, I am not selling any soaps based on masters I didn’t design/own myself. I don’t sell much soap, anyway. 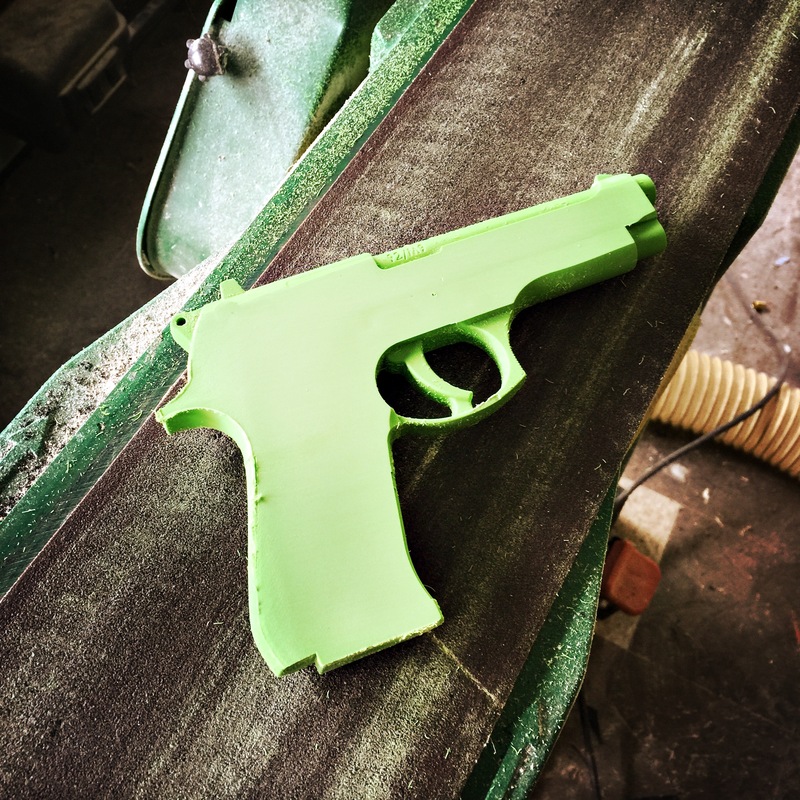 The molds from other people’s masters – like the Lenin and Ganesh molds and this gun – that I just do for fun and to give to people at random? I don’t think it’s a problem. If I were trying to sell tons of Fight Club soap I’d expect to get a “cease and desist” from Warner Brothers – but so far I think I’ve probably done 100 bars of Fight Club soap and it’s all gone to friends and family and it’s not for sale. The model is in a mold box (I’ll show you in a second) and now it’s time to mix the silicone. That’s super easy – 1:10 silicone to catalyst. 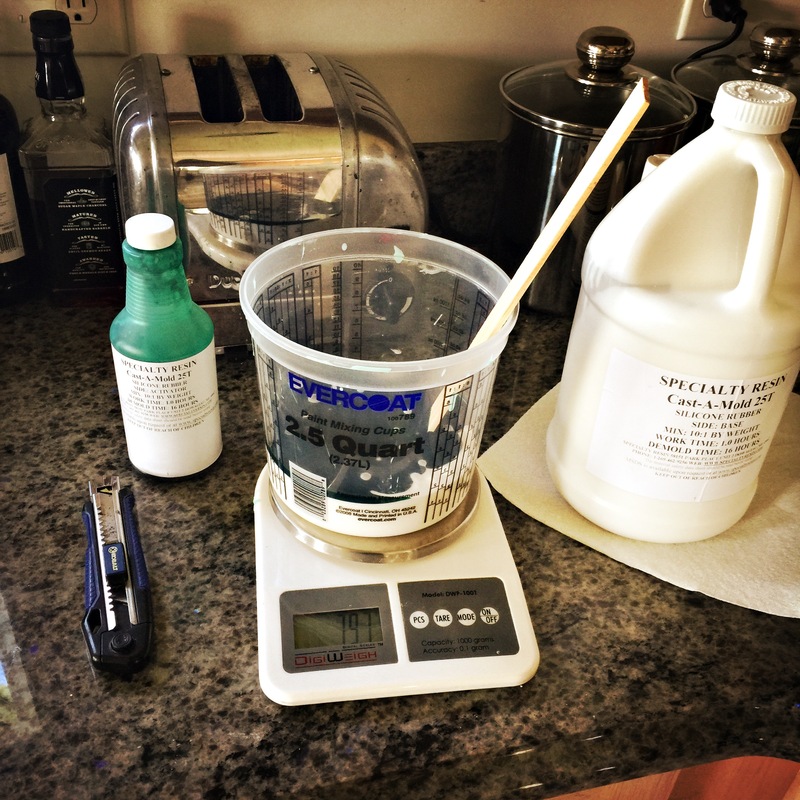 So you bloop* a bunch – in this case I estimated 600g of silicone onto the scale, hit tare, and add 60g of catalyst then stir it up. The catalyst is colored so you can tell when it’s thoroughly mixed. I buy paint sticks and mixing cups on ebay by the case-lot. You can reuse cups by peeling the silicone off when you’re done. Then you pour the silicone onto the object and wait 8 or 9 hours. One trick with a complex mold where you think air might catch (in this one: the screw heads) Bloop a small amount of silicone over the top surface of the object. Then, as it spreads out and stretches across the surface, use a toothpick to pull the bubbles out of cracks. Once you’ve de-bubbled the thin skin on the surface, then you can pour the whole thing and you won’t wind up with $40 worth of silicone that has a bubble right in the most detailed part. 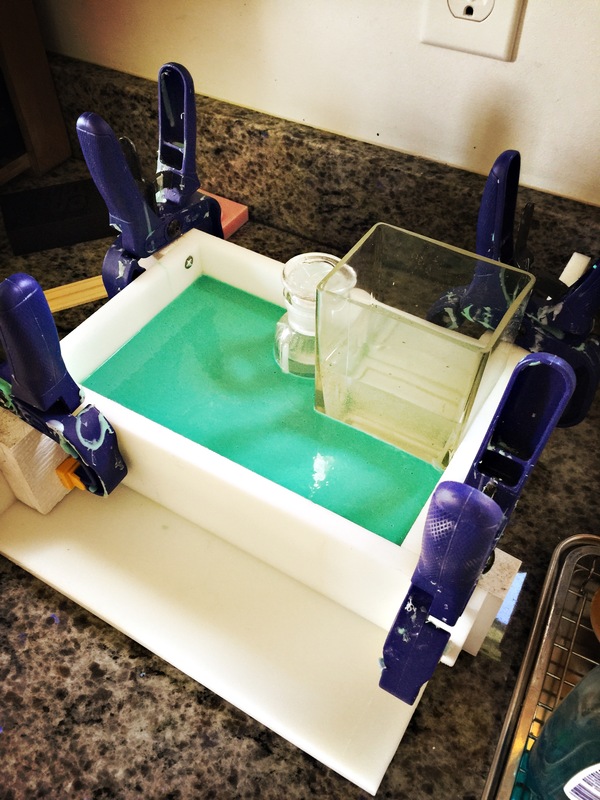 The mold box: this is an adjustable mold box trick I learned from another mold maker. 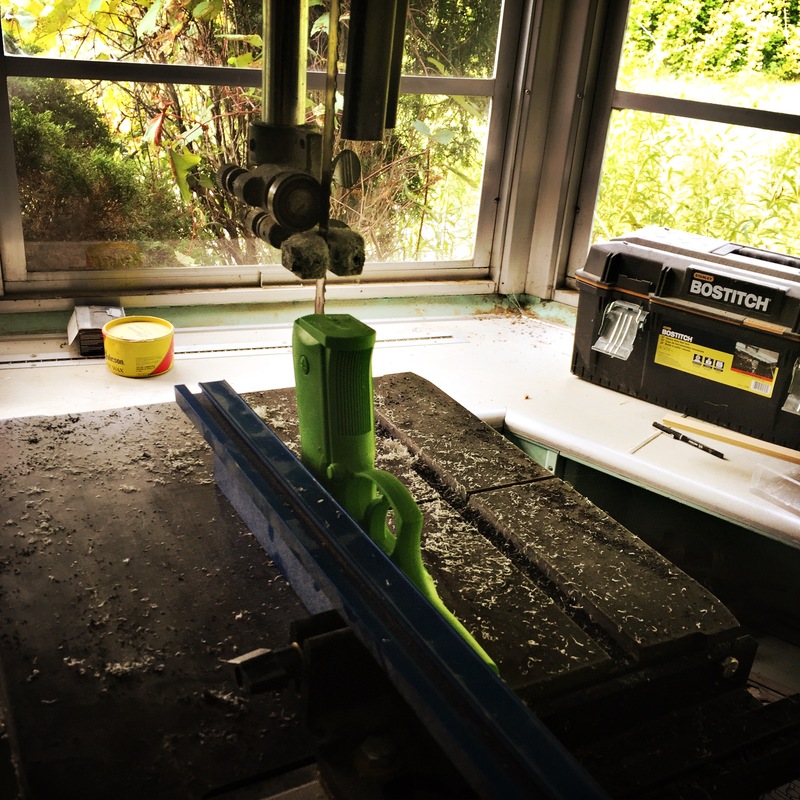 If you see old-school mold-makers like Adam Savage do a mold box, they go at it with cardboard and a glue gun and they make a close-fitting box that minimizes the amount of silicone you use. Guys like Adam can also estimate the volume of a box with scary precision. I use the “adjustable box plus spacer technique” The bottles are full of water to make them heavy and they just take up space in the box. Adam would have taken 4 minutes to make his box but I would have had mine set up and ready while his glue gun was still heating. The base of the box, and the sides, are table-sawed off a sheet of 5/8″ polyurethane board that I got from Ridout plastics. Stainless screws hold on PVC blocks for the clamps. It’s all very neatly cut so that everything is practically airtight – silicone is kind of heavy and slowly creeps through tiny cracks. Some mold makers will run a thin bead of vaseline on the joints of the box (Adam uses hot glue) but my poly boards are heavy, nothing sticks to them, not even epoxy resin, and they’re precise and indestructible. There’s a hole in the base of the box so I can run a screw up into (whatever) if I need to hold it down. Silicone is heavy, and it’s really really embarrassing when you put your model in the box, pour in $40 worth of silicone, and your model floats to the surface. Then, about all you can do is cuss. The screw also keeps your model from sliding around, which means you can get the box frame tighter to it. For those who care, I am using silicone from Specialty Resins (you can read) I buy it on Ebay by the gallon. It’s about $125 a gallon right now. I can make a half-dozen molds from a gallon. When it’s cured, you unscrew the screw in the base, unclamp the sides, pop the box apart and pull the object out. I trim the edges with a pair of scissors because it’s fun and the slightly chamfered edges keep the mold from vacuum sticking to the counter-top, which can be awkward when it’s full of gooey un-solid soap. You can see how flexible the silicone is, from where it’s bending under my hand. When you’re demolding an object you eventually learn the best places to push and bend to pop it out with minimal damage. If I wanted to, I could pour resin or resin-impregnated metal and I’d have a pretty cool copy of the original training gun. Or I could pour melted chocolate and have a chocolate gun. 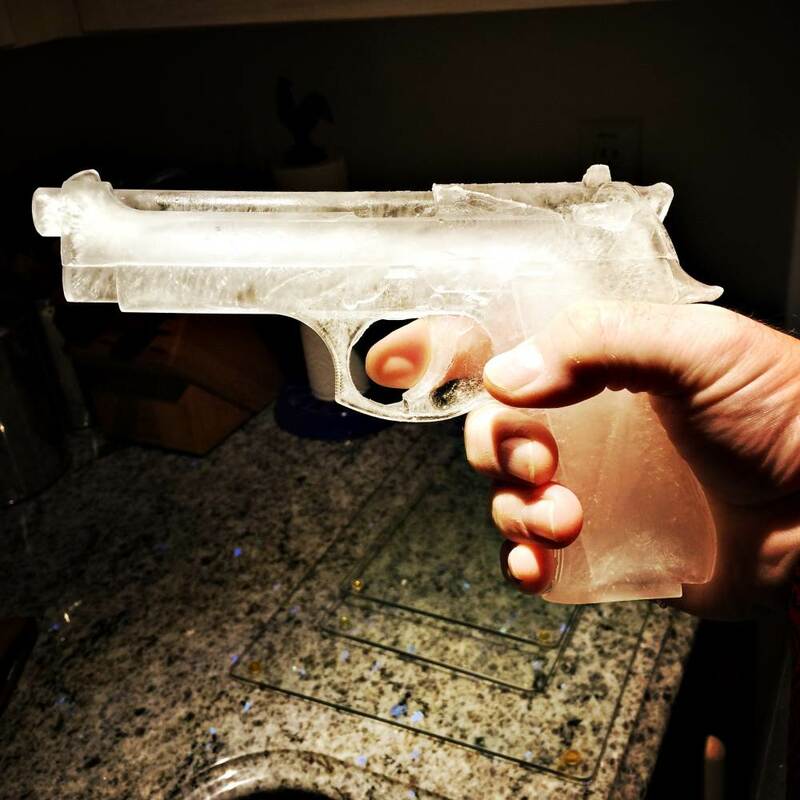 Or I could fill it with water and freeze it and have an amazingly detailed, inexpensive, ice gun. The one thing I would not have is a dangerous gun. I bet that cop in Florida wishes he’d been packing a chunk of chocolate instead of a loaded 9mm. I do, too. Oh awesome! When I am injecting wax in a mold (I’m a jeweler for those who don’t know) I have to worry about air being trapped in the mold as the hot wax goes in. Therefore I make a series of very fine cuts with a scalpel blade to allow the air somewhere to go. 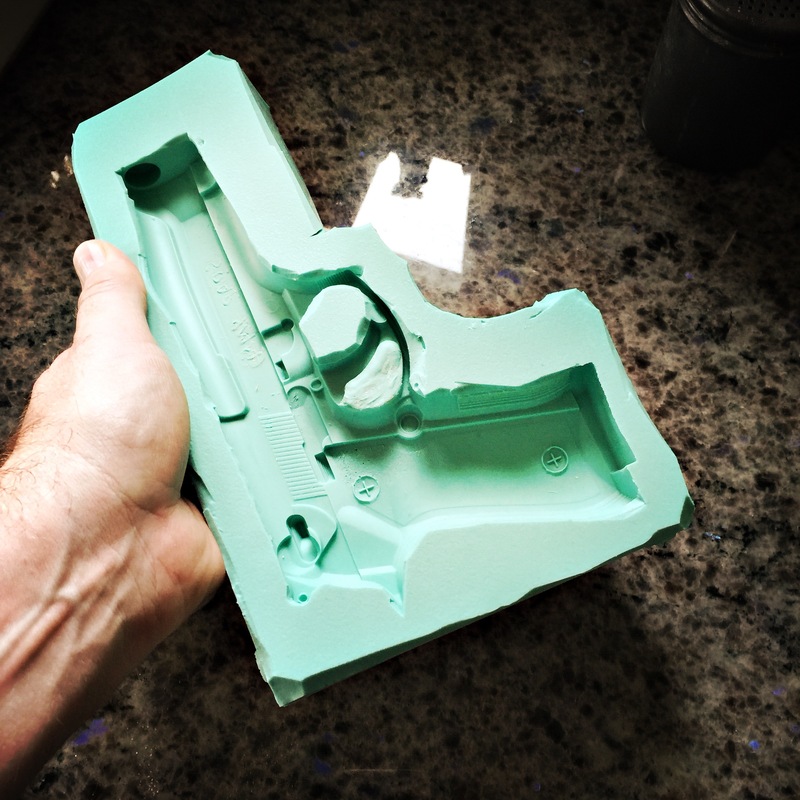 I expect having air bubbles in an ice gun or soap gun is not that big a deal (it is in wax) so maybe it’s not an issue? Do you have to use some sort of mold release? That is a very cool mold. You should definitely have a big party with a huge punch bowl with ice guns floating in the punch to keep it cold! Bubbles are only an issue if they’re on the surface. So many mold-makers and resin casters just worry about a skim coat and then fill behind it with whatever. Some mold-makers and casters use a vacuum degasser system to get larger bubbles out. With larger resin objects a lot of the time you rotationally cast them or “slush” cast them – basically shake and roll the mold so the resin covers all the surfaces – then backfill with foaming resin for strength. You can make some amazingly lightweight stuff that’s very strong that way. Silicone is particularly delightful. There’s a saying in the mold-making world: “nothing sticks to silicone but silicone” which is pretty much correct. You still have to worry about mechanical locking. I did a mold involving some lingerie, once, and the silicone that flowed through the holes in a nylon stocking… oooh, that’s hard to remove cleanly!